Accidentally delete a file and empty the Recycle Bin or lose all your files because of formatting or system crash? No worries. This instruction can help you with all types of hard drive recovery issues and get back deleted or lost data as well as partitions from hard drive even when computers cannot boot. You can click links below to read content you are interested in. Hard drive recovery case 1: How to recover deleted files from hard drive free in Windows? Hard drive recovery case 2: How to recover lost files from formatted hard drive? Hard drive recovery case 3: How to recover data from corrupted / RAW hard drive? Hard drive recovery case 4: How to recover files from damaged hard drive? Hard drive recovery case 5: How to recover files from hard drive when computer fails to boot? Hard drive recovery is the process restoring lost files or partitions from hard disk or external hard drive which is logically or physically damaged. Hard drive is one of the most important components in computer, as it is responsible for storing operating system and user data such as photos, documents, apps, videos, etc. Hard drive data loss brings severe issue to users and the recovery should be carried out. In general, the recovery can be completed by hard drive data recovery software when data loss is caused by logical errors such as accidental deletion, formatting, partition corruption, hard disk repartition, system crash and so on. As long as lost files are not overwritten, you can successfully get back lost data from hard drive using recovery software. The disk recovery can also be done by experts who provide professional services on local shop or online recovery center. Such services can deal with more complicated data loss issue, but the price is usually very high. Besides, retrieving data from physically damaged hard drive also should be done experts. Some hard drive has to be unsealed so that files can be retrieved from platters directly. In this instruction, we only talk about how to recover hard drive using recovery software, so that users can do it by themselves. Since data loss causes vary from one to another, methods to recover data from hard drive are different. Data loss can be one of the accidents we cannot avoid and almost all people can be exposed to data loss risks. Backing up hard drive data can help us prevent file from being deleting or formatting. However, most of us are not careful enough to back up crucial files every day. Thus data loss is relatively common occurrence. Factors leading to hard drive data loss can be different on each data loss problem. Knowing the most common causes of data loss can help us prevent and avoid the issue in daily lives. Besides, it can also help us recover lost files from storage device more efficiently, as recovery methods differ from one to another in line with data loss causes. Here are list some of the most common causes of data loss as a reference. Accidental deletion of data. The top cause of data loss is deleting files which do not have any backups available. In Windows, deleted files can be restored from Recycle Bin, but in many cases, files cannot be directly restored, for example, files deleted from external hard drive which does not have a Recycle Bin; the deleted file is too large and cannot be put into Recycle Bin; files are deleted using Shift + Delete; Recycle Bin gets emptied. Unintentionally format hard drive or partition. Formatting a hard drive or partition will cause instant loss of information stored on it. Users may format a disk by selecting the wrong device or partition, or try to repartition a hard disk which contains partitions already. Besides, some users format volume or hard drive for the sake of changing file system formats. The bright side is that most files can be recovered after a quick formatting as long as lost files are not overwritten. Computer virus or malware attack. There are countless viruses and malware threating data security. Virus and malware can not only steal users' private data, but also delete or corrupt files on purpose. Thus, you have to make sure the anti-virus software installed on your computer is always up-to-date. RAW and inaccessible drive. File system corruption usually turns hard drive or volume into RAW or inaccessible. In such case, you cannot access data on the drive in Windows Explorer, what you get is error message such as "Location is not available. G:\ is not accessible. The file or directory is corrupted and unreadable." "The disk in drive H is not formatted. Do you want to format it now?" "The parameter is incorrect." Partition loss. Users would like to divide hard drive into several partitions so as to improve performance of the disk. 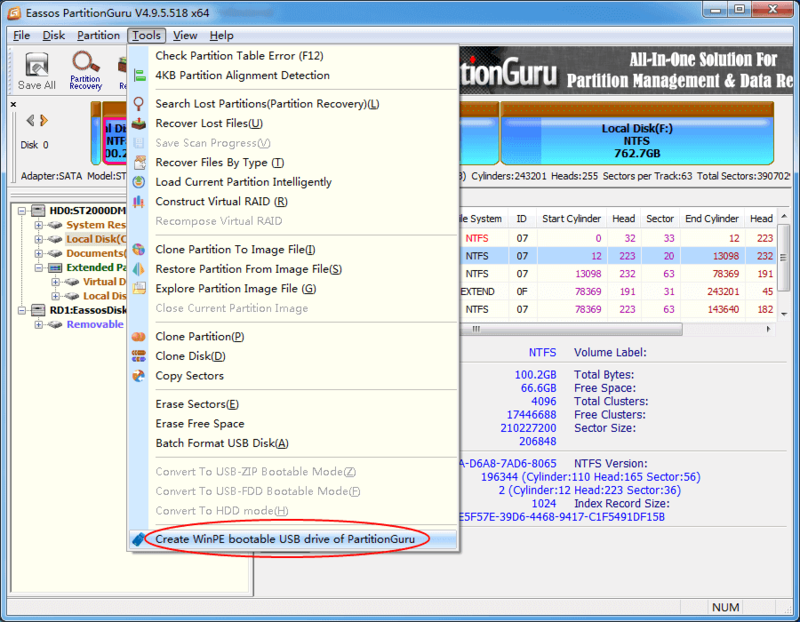 Partitions hard disk can also get lost due to deletion, partition table error or hard drive repartition. Once partition gets loss, all data contained in it will be gone. Hard drive bad sectors. If sectors on hard drive cannot be read or written properly, they are bad sectors. Bad sectors can be both logical and physical corruption on hard drive. 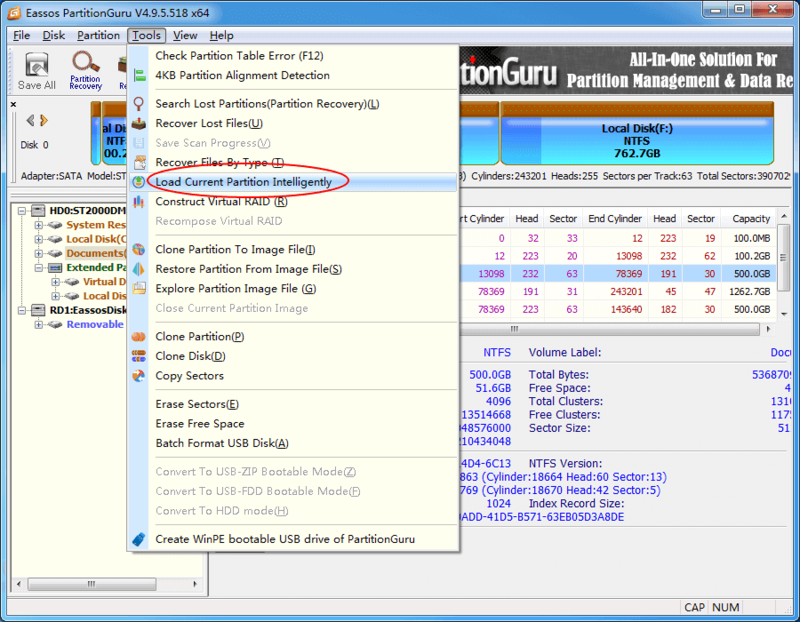 If a hard drive contains bad sectors, partition might be corrupted and files get lost. Operating system crash. Operating system crash can be caused by many reasons such as unexpected system shutdown and virus. If system cannot function as normal, you cannot access data or even partition disappears. Improper operations to hard drive. Many users do not take good care of storage device, for example, remove external hard drive directly without using safely removal feature provided by Windows. Other reasons. Hard drive data may get lost due to theft of computer, water damage, natural disaster, etc. This solution includes three methods to restore deleted files from hard drive or other storage devices, and you can try them one by one. Step 1 Open the Recycle Bin by double-clicking its icon from desktop. Step 2 Browse files in Recycle Bin and locate the one you want to restore. You can filter files via deleted date, file's original location, file name, type, etc. Step 3 Select and right-click on files or folders you want to restore and click "Restore" option from context menu. Then selected data will be restored to the original location when it got deleted. 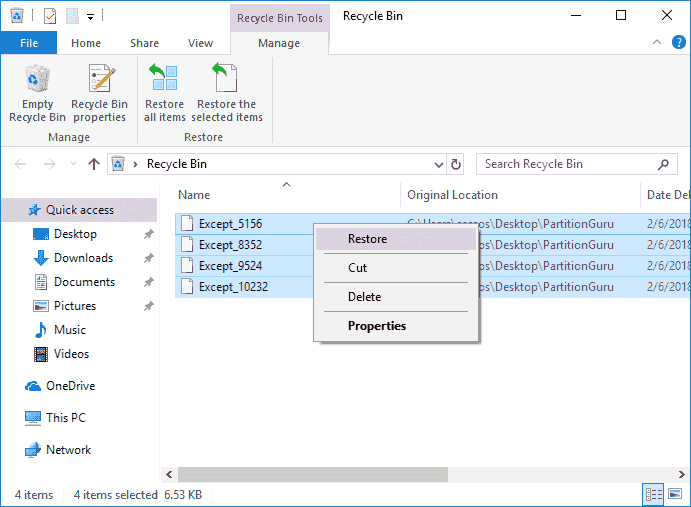 If you've emptied Recycle Bin, you can retrieve deleted data from previous version. The older versions are created by Windows built-in backup feature, thus this method requires you've created such backups. For Windows 7 users: Open Windows Explorer by double-clicking Computer icon, and find out the folder that contained deleted data; right-click it and select Properties; click on Previous Versions tab and you can a list of older versions; select the version you need and click Restore. For Windows 10/8 users: Double-click This PC to access File Explorer, then locate the folder which contained deleted data. Right-click the folder and select History to check all files in the recent backup; Click Previous button to select files you want to restore and click the Restore button (It has a green and circular arrow). It is known to most users that files are recoverable even after they are deleted from Recycle Bin. That's because when a file deleted by system, only the bit of information pointing to data location is erased and the data content stays on hard drive being invisible. File pointer is responsible for telling operating system file's exact location. If it is removed, the corresponding file will be invisible to system. Thus the deleted file can be recovered before it gets overwritten. 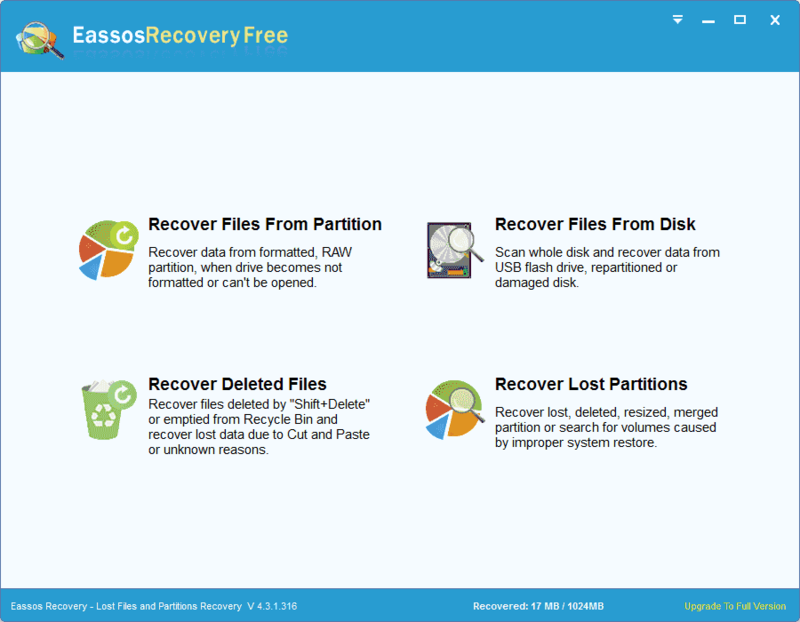 Now we'll show you how to get back deleted files using free hard drive recovery software, Eassos Recovery Free. 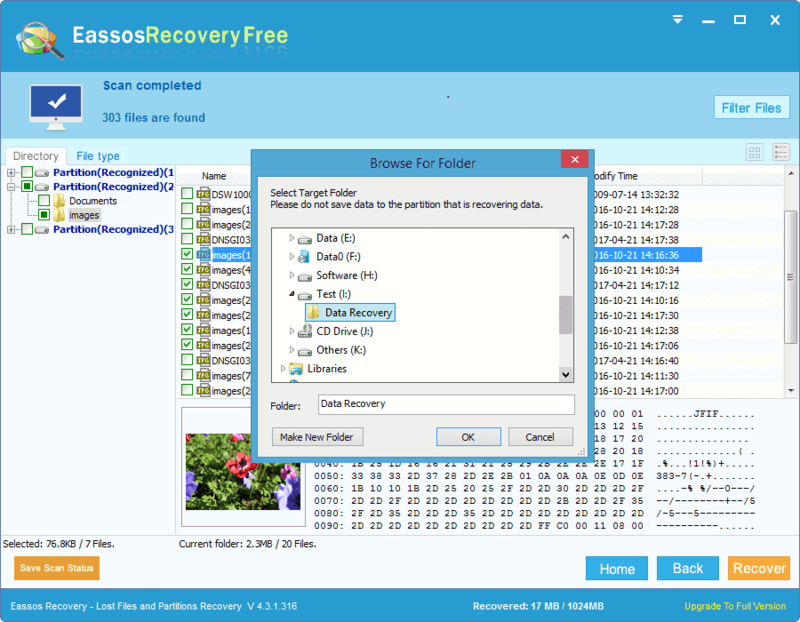 This freeware can be used to deal with basic data loss situation like deleted recovery, partition recovery, format recovery and more from PC, HDD, external HDD, flash drive, SD card, etc. The following content is a step-by-step guide on deleted recovery. Step 1 Launch Eassos hard drive data recovery software and select "Recover Deleted Files" option from the main interface. 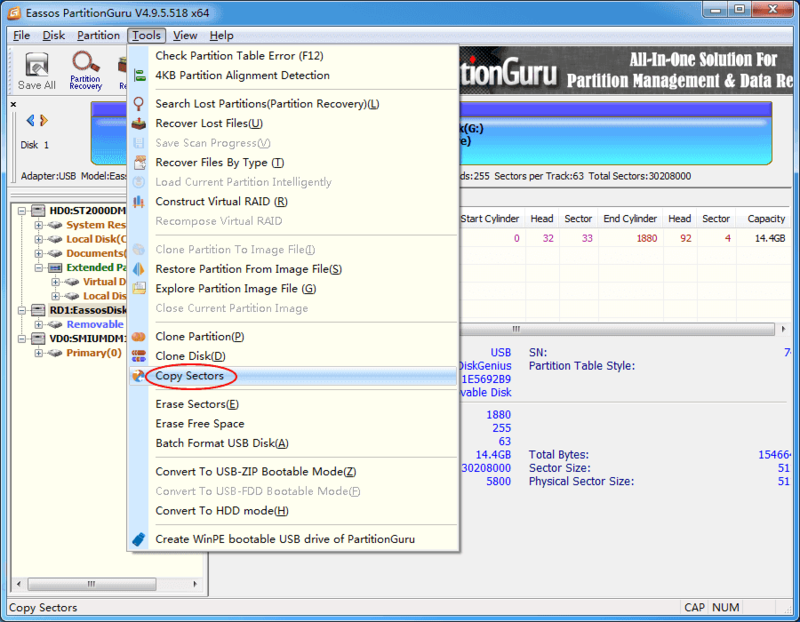 Step 2 Select the disk partition or location where deleted files were stored and click "Next" button. Then the program will start a quick and full scan to look for lost data. Step 3 Preview and filter recoverable files from scanning result to look for desired files and check if files are correct. Step 4 Select files you want to recover and click Recover button to restore them to a secure location. Formatting hard drive can help you quickly delete data as well as prepare disk to be used for new data. Operating system is able to carry out quick format and full format, but it cannot unformat disk. Thus we need hard disk recovery software to recover files after formatting hard drive. In this section, we'll use professional data recovery software to get back formatted data from hard drive. Step 1 Install and launch advanced hard drive recovery software Eassos PartitionGuru Pro from your computer. Then you can view all partitions and disks attached to your PC. Note: DO NOT install the software to the formatted disk or volume in case of overwriting lost data. Step 2 Select the formatted storage location and click File Recovery button from toolbar. This will open the Recover Files window. Step 3 Select "Complete Recovery" and "Search For Known File Types" options and click Start button to search for lost data. Note: If you also want to recover files deleted before formatting, you can select "Recover Deleted Files" option before starting scanning. You can preview files during scanning to check if files are correctly. If all files you want to recover have been displayed before scanning completes, you can stop the process in advance. Step 4 Choose files and folders you want to recover and right-click on them to select "Copy To" from context menu. Then you can select a folder to store recovered files. What is RAW drive? RAW file system is not actually a file system format and it means partition file system goes wrong. Normal file systems are NTFS, exFAT, FAT32, EXT3, HFS, etc. Once a drive becomes RAW, you cannot access files in it. In Windows RAW drive is not accessible and reports error message like "Disk in drive is not formatted. Do you want to format it now?" or "The volume does not contain a recognized file system. Please make sure that all required file system drivers are loaded and that the volume is not corrupted." Step 1 Launch Eassos PartitionGuru Pro from your computer and you can see the RAW drive in the software. The drive can be shown as RAW or Unknown. Step 2 Select the RAW drive in the software and click Files tab on the right pane. Then you can check if your files can be displayed directly. In many cases, files and folders in RAW drive or other inaccessible partition can be listed directly once the software is launch. If files are display, you can save them to another drive. If not, then move to Step 3. This option can list files in corrupted NTFS partition without doing any scanning. If the RAW drive was NTFS file system, you are likely to get your files shown in the software quickly. If the drive is badly damaged, then you have to try Step 4. Step 4 Select the RAW drive and click File Recovery button. Then you can perform a quick and full scanning to locate desired files. Step 5 Select data you want to retrieve and choose "Copy To", so that you can save files to another drive. If your hard drive damaged and contains bad sectors, it is hard to retrieve files from it, as file scanning done by recovery software cannot proceed on bad sectors. In such case, we need to image hard drive, and recover files from image file. Thus we need to create a disk image first and then recover files from image file. The image file will be a large file which contains everything of the damaged hard drive, and you need to prepare a large hard drive in advance. Step 1 Launch Eassos PartitionGuru, click Tools and select Copy Sectors. Step 2 Select source disk and destination disk and click Copy button. Then the disk image starts, which may take long time if the disk has very large capacity. If the original disk contains bad sectors, you can also select "Skipping sector count when meeting bad sectors". Step 3 Once the disk image is created, you can select the image in PartitionGuru and click "File Recovery" button. Step 4 Select "Complete Recovery" mode and click Start button. The program will search for recoverable files. Step 5 When scanning completes, you can select files and folders and save them to a normal drive. Step 1 Install and launch Eassos PartitionGuru on a working computer and insert a USB flash drive to that computer as well. Step 2 Select the USB drive and click Tools to select "Create WinPE bootable USB drive of PartitionGuru" option. Step 3 Click OK button on the popup window, and wait for several seconds and the bootable disk will be created. Step 4 Connect the bootable USB drive to the computer that cannot boot and restart the computer and enter BIOS to change boot sequence. Make the USB drive in the first boot order and restart computer. Step 5 Now the computer will boot from the USB drive and Eassos PartitionGuru will be launched automatically. 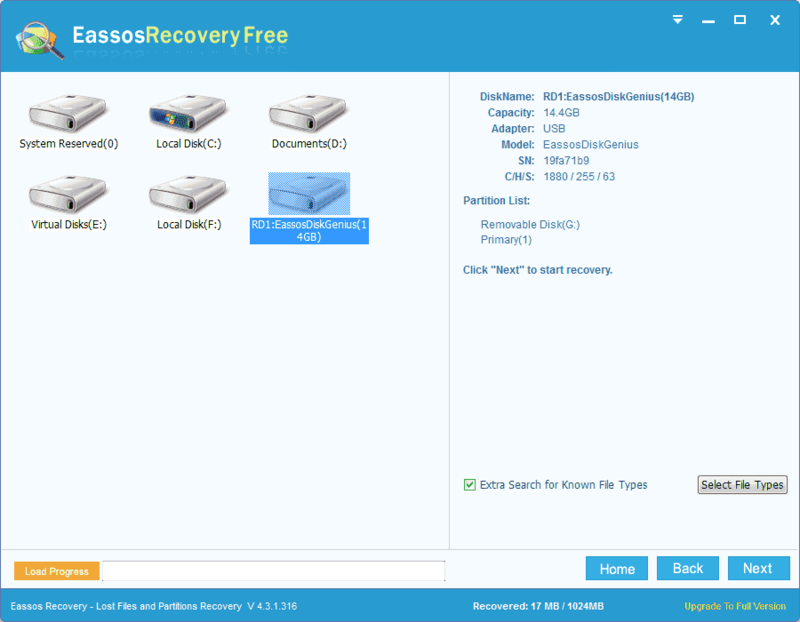 Select the disk where you want to recover lost data and click File Recovery. Step 6 When scanning is done, you can save desired files to a different location and get files recovered. Backup important data: Data backup can never be ignored and it is also cannot be replaced if you want to avoid data loss problem. You should keep at least one copy of original data on a different partition or storage device. Besides, backup should be done on a regular basis. Form good habits on using hard drive: developing good habits while working on your computer can help you bypass data loss issue, for example, partition hard drive and do not store personal data on system partition. Use anti-virus software: Virus and malware can infect your computer when you download a program or an email attachment. It is recommended to install anti-virus software and keep it up to-date. Be careful when deleting files: when you delete files using Shift+ Delete or empty Recycle Bin, you should think twice before deleting data, making sure they are no longer needed. Keep storage device safely: hard drive is fragile to water, heat, strike and other possible physical damages. Use an UPS: unexpected power failure can damage hard drive or even cause data loss. You can add an UPS for your PC, which gives ample time to save documents and shut down computer when power failure occurs. This guide explains a couple of solutions on hard drive recovery, including recover deleted or formatted files from hard drive, restore lost partitions, recover data from damaged hard drive and retrieve data when system cannot boot. You can follow this tutorial to perform hard drive on various data loss situations, and hope this helps a bit. If you have any questions and need further help, please feel free to leave a comment or contact our support team.